Principal Consultant , David Allison Inc.
I’ll start with a warning that anyone who doesn’t like exclamation marks should stop reading right now. This story makes me angry. It is the inspiration for this anti-anti-development rant and I know my natural tendency towards overusing the e-point is going to be very much out of control while I write this. Why? Because those of us who make a living in and around the development industry have a ‘bad’ reputation. People think we are schmucks because, frankly, some of us are, sometimes. No different than dentists or teachers or artists or anyone else. But because we are building cities, and dealing in units-of-production called homes, we are under a greater degree of scrutiny by the media and, well, by everyone, than most other industries. So when one of our own puts a shoulder to the wheel and tries to do something amazing, and is harangued and smeared with a campaign of misinformation, it gets me worked up. Sorry if I’m a little OTT, but it hurts all of us when this happens. So here we go. First let me introduce the cast of characters. Daniel Boffo runs Boffo Properties here in Vancouver. His Dad started the company a lifetime ago, and now it’s Daniel’s turn to drive the car. His is a very traditional development-family story: growing up sweeping the construction sites as a kid, working the sales centres when he got a bit older, and eventually getting the chair in the corner office. Nice guy. Real down to earth. Humble. Nancy Keough runs The Kettle Friendship Society, a very worthy not-for-profit that has been helping the most marginalized members of our society for more than 40 years. They offer food, lodging, counselling and all kinds of other essential services in one of the most troubled parts of town. She’s an angel. For a decade now Nancy has been trying, unsuccessfully, to find government funding or any funding to build a new home for The Kettle. They are out of space, and the space they do have is falling apart. So Daniel meets Nancy and they hatch a plan. 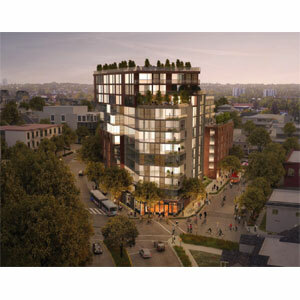 In place of a dry-cleaner, an old banquet hall, a parking lot, and the existing Kettle Society HQ, they have formed a co-development partnership to build a new home for The Kettle, as well as more supportive housing, and, to pay for it all, some market housing condos and retail units too. The new Kettle/Boffo building was originally designed to be several stories higher than permitted on the site, but the community benefits of a new and expanded Kettle Society, supportive housing units, and market-housing for families (in short supply in these parts) seemed so immense that Daniel and Nancy thought they’d have a pretty good chance of getting the zoning changed. Like all zoning variance issues it has been a back and forth process. Since 2012. That’s four years for anyone doing the math. If you go to the project website you can see a timeline that details it all. There were open-house meetings, with notices sent to thousands of homes, and lots of hearty robust give-and-take, as there should be. The plan was revised to just 12 storeys. That’s not a high-rise tower by anyone’s definition: it’s a mid-rise. Oh, and there is already a 13-storey building across the street. Let’s keep that precedent-setting point in mind as we carry on with this story. A group of community activists have taken it on themselves to spread misinformation about the project. For reasons only known to them. They say it’s because it will change the character of the neighbourhood. But there is already a 13-storey tower across the street, and three other buildings of 10-storeys in the vicinity. The corner we are talking about here is Commercial Drive and Venables: a very busy intersection full of cars and retail up and down the streets, and all kinds of urban activity. It’s not like they are plopping a 12-storey building in the middle of a leafy-green street full of single-family homes. The reality is that 12 storeys is the least number of floors it can be and still fund the Kettle Society expansion. So while these activists are jumping up and down and telling people that this shouldn’t be allowed to be more than four storeys tall, what I don’t think they realize is that four storeys means no new home for The Kettle. No expanded outreach to the people who need it the most. No supportive housing. No 2 or 3 bedroom market housing for families. There is none of that. Instead, the developer could go ahead and build a four-storey market housing building with the most saleable condos possible and walk away with a standard profit! But, he’s taking it on the chin and being painted as an evil profit-driven bad guy. He has voluntarily put up with close to five years of tumultuous nonsense because he believes that Nancy and The Kettle are important to the neighbourhood and he wants to do the right thing. Are the activists anti-Kettle? Or just so short-sighted that they don’t realize their campaigning might actually prevent The Kettle from getting a new and better home to help more people? Or is there something else going on here? One more time: a developer and an undisputed agent of social good team up and want to build something the same height as the building across the street, at a busy intersection. It’s a project that doesn’t require tax dollars, and where no one is displaced. To prevent it from happening a group of community activists are misleading anyone who will listen about the size and scale of the project. Apparently they are currently telling people that it is three towers, of eight, ten and twelve storeys. Before this, they were telling people it was a 12 to 20-storey tower. Daniel Boffo told me he’d protest the tower himself if it was actually what the activists are telling everyone it is! If Boffo and Kettle used the tactics the activists are using to make their point, they’d be — I don’t know — taken to court? Thrown in jail? Crucified by the media? Why can a small group of community activists hijack a process that has nothing but good intentions? Will the developer make a profit? Of course he will! Why shouldn’t he! Is that maybe the root of the problem? We don’t want anyone to make money running a development company? I do know that writing this will mean I will be deluged with angry comments. But I’ll take all those angry comments, if those of you who believe in the Kettle/Boffo project will please let the City know by signing the pledge IN FAVOUR of this development.